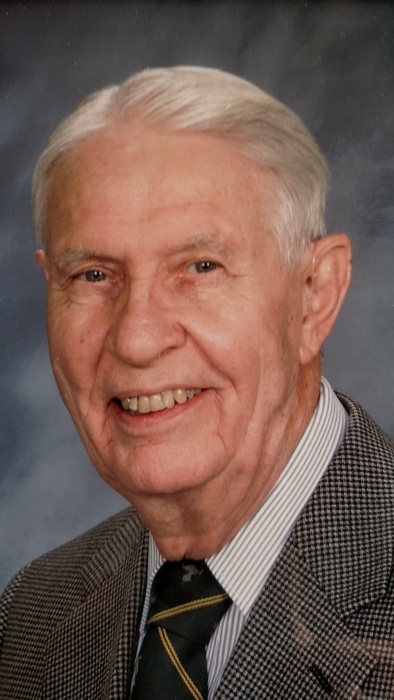 Eugene D. Anderson 94, passed away on August 5, 2018 at Manor House Retirement Community in the presence of his family. “Andy,” as he was referred to, was born on the family farm in Magnolia, Delaware to Homer Betts Anderson and Lula Ruth Catlin Anderson. He was stationed in Hawaii during WWII. When he returned home, the family sold the farm in Magnolia and moved to Wyoming, Delaware. He then attended the University of Delaware where he earned a BS in Agriculture. He was president of the Ag Fraternity his senior year. He began a career in Sales with International Harvester in Salisbury, Maryland. From Salisbury to Harrington, Delaware and finally, a move to Annapolis, Maryland. He also was a builder agent for Lesco Homes, working for the Federal Government and eventually retiring after many years in residential property sales. He worked for several agencies including his own business, Southland Realty. In 1952 he met and married the love of his life, Dorothea C. Cohee of Woodside, Delaware. They would make their home on the Chesapeake Bay for fifty years before moving to Delaware. Andy was an avid bird hunter and trainer/field judge for Brittney hunting dogs. He also spent many hours crabbing and fishing on his pier or out in the Chesapeake. He enjoyed taking his grandchildren out in his boat for many crabbing and sightseeing excursions, exploring the shoreline as well. He was known for grilling the oysters “just right” for all his family members in the Fall. An annual Christmas in the Carolina’s was spent with the family in Chapel Hill and always a game of golf on Christmas day with Rodney Sr. and grandsons. The holiday was concluded by heading to Jekyll Island, Georgia to welcome the New Year. After moving to Seaford, golf became his passion and he played as often as possible at the Seaford Country Club and Chapel Hill Country Club in Chapel Hill, NC with his family. He lived in the Little Meadows community in Seaford with his wife, Dorothea and cherished the many neighbors and friends they grew to know there. After Dorothea’s passing, he eventually moved to Manor House and soon became friends with the community there as well. He was an active member of the University of Delaware alumni group at Manor House. Throughout his life, he never met a stranger and to his family, he was lovingly referred to as “Po” and Uncle Gene. Nieces, Pat Kobza of Dover, Delaware, Becky Hurley of Northwood, Ohio, (Jerry) and Vicky Biegler, (Gerald) of Colorado Springs, Colorado. Nephews, Jack Poore of Smyrna, Wayne Poore, (Sylvia) of Gainsville,Florida, Dennis Poore, (Patreetzia) of Boynton, Florida, Roland Carter Jr. of Harrington, Harvey Marvel, (Kate) of Milford, Randy Marvel, (Linda) of Milford and Dave Hugg III, (Jacqueline) of Smyrna. Many Great and Great Great nephews and nieces also survive him. The family wishes to thank the many, wonderful staff members at Manor House who provided such a high level of care and a loving environment, that he called home. 300 Shipley Street in Seaford.